Q1) Time Dilation: What is the physics meaning of SR’s time dilation equation? Does it describe physical, asymmetric effects? If yes, does it mean that clocks traveling with a relative velocity will accumulate proper time at different rates? If yes, does that mean that time itself is affected by relative velocity? Does it say that two observers in different inertial frames will JUST observe the other’s clock to be running slow with no attendant physical effects similar to when two twins separate and each observes the other to “shrink” whereas no physical effects occur? “Time Dilation” in Special Relativity (SR) is different than “Time Dilation” in General Relativity (GR). Time Dilation in Special Relativity (SR) operates under the guidelines that there is no “Gravitational Field” present, or that there are no Gravitational influences affecting the frame of reference, time, motion, and mass of an object at rest or in uniform motion. General Relativity is just the opposite. It assumes that there is a “Gravitational Field” present, and that there are Gravitational influences that affect the frame of reference, time, motion, and mass of an object at rest or in uniform motion. Q) Does it describe physical, asymmetric effects? I am not sure that I would use the word asymmetry, that word could be confusing to some. But “Yes” it is argued that moving clocks “physically” slow down. Whether you describe that as symmetry or asymmetry is another question. Q) If yes, does it mean that clocks traveling with a relative velocity will accumulate proper time at different rates? Also let’s define the frame of reference for our clocks and declare that it is the “Proper Observer” Frame of Reference. The Proper observer assumes that his clocks are ticking at normal rates. And there is another frame of reference known as the “External Observer” Frame of Reference. And let’s assume that the External Observer is in a frame of reference that is at rest watching the “Proper Observer” move either away from him, or move either toward him. Now let’s look at the math, without deriving the result. Let’s assume the classical Special Relativity (SR) Time Dilation equation. 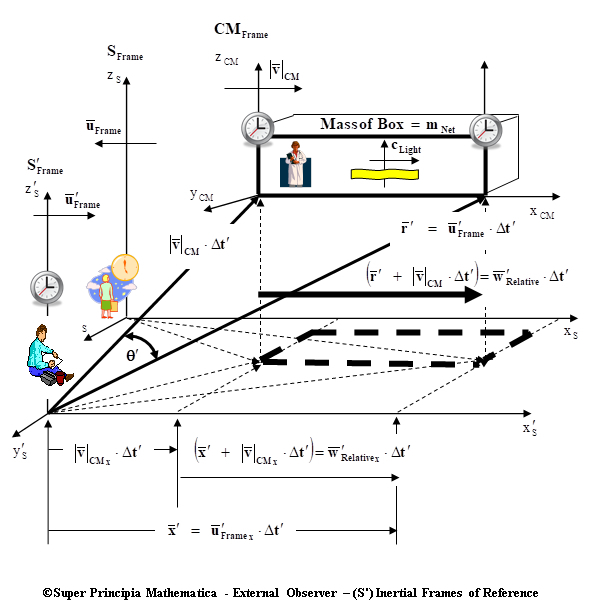 From the measuring apparatus of the Proper Observer, he will conclude that time runs normal in his frame, and that the External Observer measures time moving slower or faster depending on the Center of Mass Velocity for the frame – . The actual Time measurement in the Proper Observer Frame is this; if you include synchronization or “twin” synchronization. 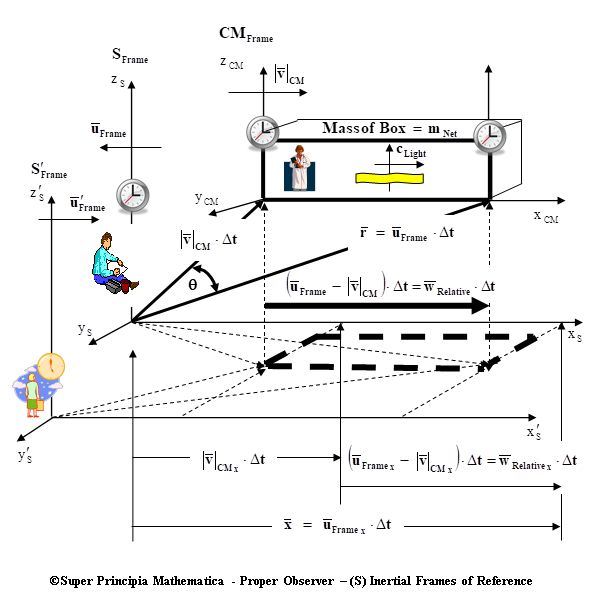 From the measuring apparatus of the External Observer, he will conclude that time runs normal in his frame, and that the Proper Observer measures time moving slower or faster depending on the Center of Mass Velocity for the frame – . The actual Time measurement in the External Observer Frame is this; if you include synchronization or “twin” synchronization. Q) Does it say that two observers in different inertial frames will JUST observe the other’s clock to be running slow with no attendant physical effects similar to when two twins separate and each observes the other to “shrink” whereas no physical effects occur? The two observers in different inertial frames of reference will observe the other’s clock to be running slow, and also the physical effects also occur for the frame that is in motion. This entry was posted in The Special Theory of Relativity and tagged Einstein Relativity, frame of reference, Lorentz Transformation, space, Space-time, Special Relativity, speed of light, speed of light isotropy, time, Time Dilation, Twin Paradox. Bookmark the permalink.